A Karmo Grade 1 Area Court, Abuja, on Tuesday sentenced a Labourer, Suleiman Abdullah, to eight months imprisonment for stealing glass window slides. 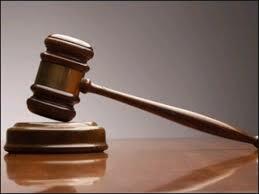 The judge, Abubakar Sadiq, sentenced Abdullah, 23, after he pleaded guilty to a two-count charge of theft. The judge, however, gave the convict N10, 000 option of fine. Earlier, the prosecutor, Mrs Auhioboh Florence, told the court that on Aug. 22, one Mohammed Sheffiu of No. 2 Works and Housing Estate, Gwarinpa, Abuja, reported the incident at the Gwarinpa Police Station. Florence said that Sheffiu reported the matter for proper investigation, which led to the arrest of the convict. According to Florence, the convict committed the offences on the same date at about 12 a.m. at Gwarinpa. The prosecutor said that the convict criminally trespassed into the complainant’s house and stole four glass window slides valued at N5, 500. Florence told the court that the items belong to one Japhet Sani. She said that during police investigation and interrogation, the convict confessed to the crime.